The market seems to be in full OPEX mode, with every attempt at a breakout — up or down — quickly aborted. 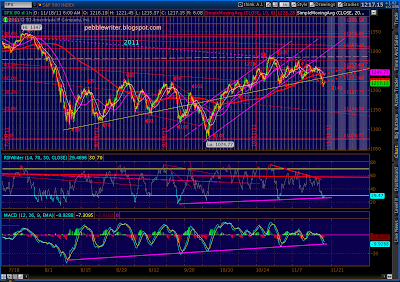 At this moment, it’s pushing toward the downside, which is a good reason to revisit the harmonic picture. A bullish Butterfly pattern (in red) that began Nov 1 finishes at 1198.52 (the 1.272). 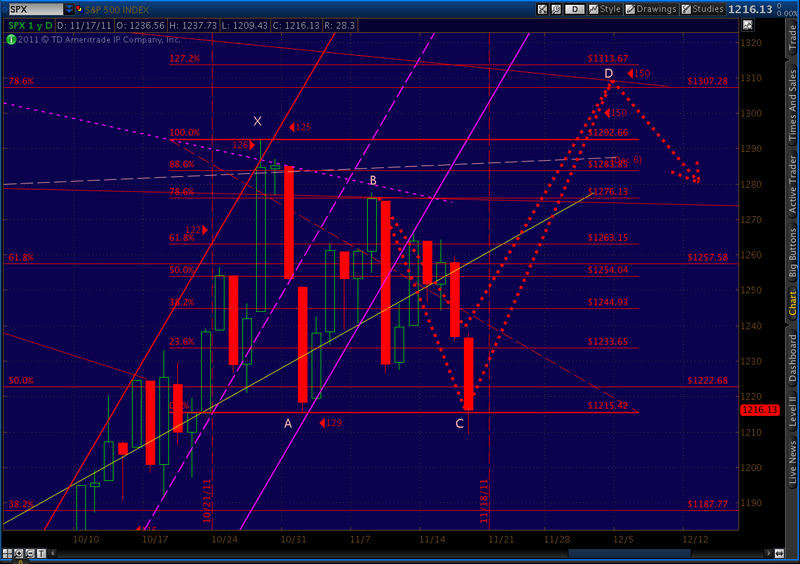 While, a smaller bullish Crab pattern (in purple) that began Nov 9 finishes at its 1.618 at 1201.71. There is also horizontal support around 1200, not to mention obvious round number support. While yesterday’s 1209 low might be close enough to consider these patterns completed, I would normally look for a more precise tag before playing the rebound. Given that this is OPEX Friday, and MM’s are under water after yesterday’s plunge, I won’t be surprised if we see a ramp job kick in if we get any closer to 1200. If they play out, initial (.618) targets for a rebound would be 1246 and 1242 respectively. 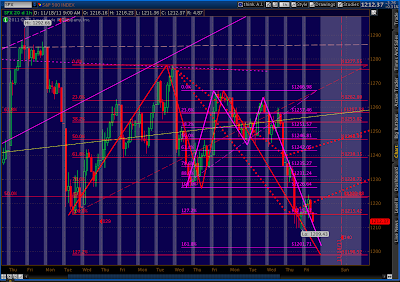 Common extension targets for the Butterfly would include the 1.272 at 1298 and the 1.618 at 1325. Higher targets for the crab would include the 1.272 at 1284 and the 1.618 at 1307 — the same value as the 78.6 Fibonacci retracement of the 1370 to 1074 plunge. Also note that current prices would make a very good Point B (about .382) for a much larger harmonic pattern with Point X at 1074 and A at 1292. 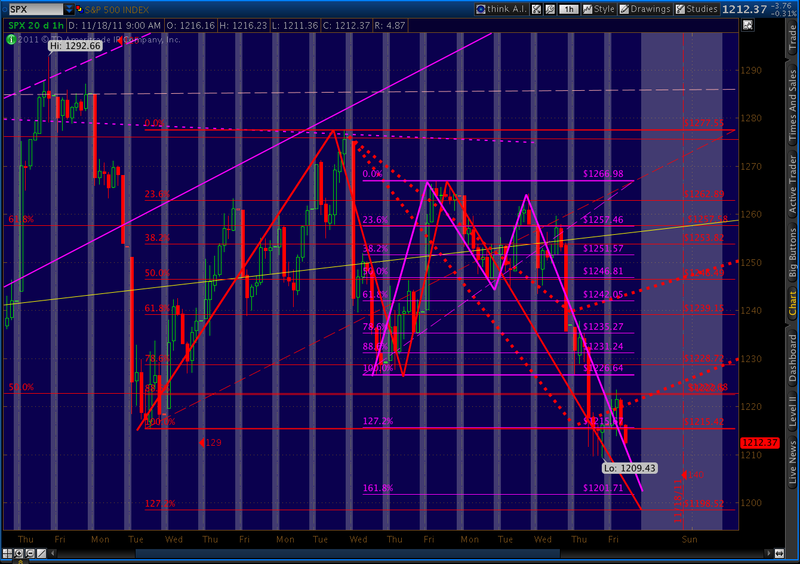 A leg up to 1242-1246 would make for a nice Point C.
The key is where Point C lands. It could go as low as A, but shouldn’t be any lower (with rare exception.) 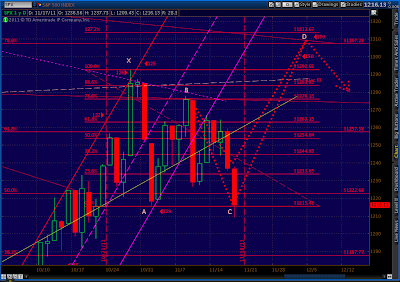 In fact, 1215 is my defacto line in the sand to determine whether we have one last leg up or not. Well, do you ever get the feeling that the universe is messing with you? We got the “downturn I’m expecting Wednesday,” a 30-pt plunge that put bubbles in this bear’s champagne. We reversed there, establishing a potential Point C smack dab in the middle of the range I envisioned. It was earlier than I expected, but otherwise okay. Now we could head back up toward what I presumed would be 1307 on December 5. Then, along came Unicredit’s $10 billion loss, Fitch’s stating of the obvious, and increased media scrutiny of the Euromess and the Supercommittee superflop. Do you ever get the feeling the Universe is messing with you? Do you ever wonder if there’s a secret government installation, buried deep under the tundra somewhere, full of ex-Goldman guys whose sole purpose it is to read all the blogs out there and rig the market to inflict the maximum amount of frustration and self-doubt? Do you ever sit alone in the dark at 4:30 am, asking rhetorical questions? There are all kinds of reasons this turd of a market should turn down right here, right now — without apologies, without looking back. The arguments are clearly laid out in all the financial newspapers and websites. Heck, you’ve been hearing them from me for months. But, then there’s the fact that we couldn’t push convincingly through 1215 yesterday. I know, we hit 1209 intraday, but we closed at 1216. Coincidence? Maybe, but it’s also possible that the triangle I’ve been harping about was one of the 46% that break downward, establishing a decent Point B in a larger A-B-C leg that’s heading for 1307-1313 on December 5. For now, I’m going to consider that “line in the sand” as bothered, but not broken. 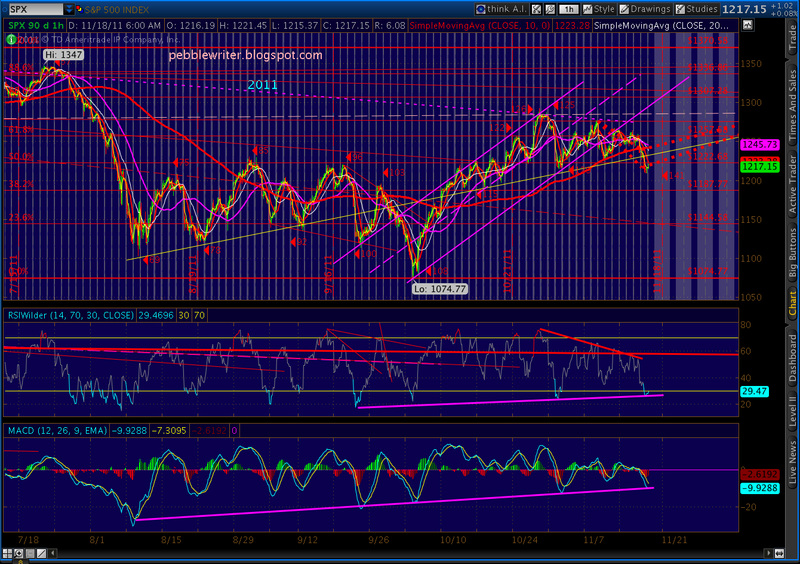 At the very least, we’re due for a bounce off of 1215. Whether it’s an OPEX-infused backtest or a larger leg up is still up in the air, in my opinion. And, finally, my gratuitous attempt to blind you with science… The 2008 v 2011 analog I’ve been reporting on since last May says wave 2 isn’t over until day 150 — about 10 sessions from now. All I’m saying, folks, is this is belt and suspender territory. I’m short as can be, but I bought a nice little insurance policy yesterday that leaves me effectively straddling the market in the short run. I may leave some profits on the table, but just in case Friday isn’t the big downdraft so many others are predicting, I’ll sleep better going into the weekend. Oops, meant 1292 as C.
True. And, 935 is very close to the target of the big Butterfly setting up (7/1/10's 1010 as X, 1370 as A, 1074 as B, 1045 as C, D to the 1.272 at 913. Of course, if you're super bearish, 1074 is Point B of a Bat or Crab starting at 666 and pointing to the .886 at 742 or 231 at the 1.618. That's a bear market I could get excited about. I completely agree with you. But, my gut is that it isn't a simple downdraft from here. 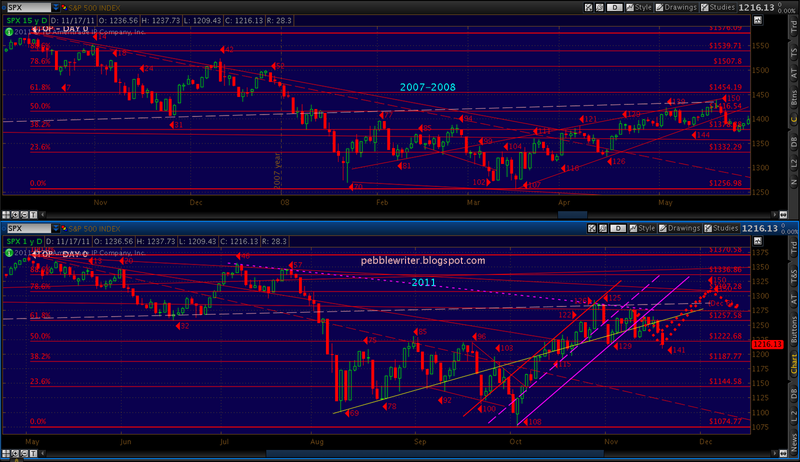 We might get a moderate bounce like I just described — with the Crab and/or Butterfly taking us back to 1242-1246. Bulls would climb on board for the more obvious trip to 1307ish, bears would liquidate their shorts (who wants to ride out a 100-pt rise?). Both would be caught off-guard by a turn back down. I think the key though, more than price, is time. With the Supercommittee's results due, the impending S&P; action, ongoing credit issues in Euroland, I'm more focused on analog day 150 coming up (Dec 2) than I am from what price we'll eventually drop. Thus, trying to stay hedged and with dry powder ready for the time being.